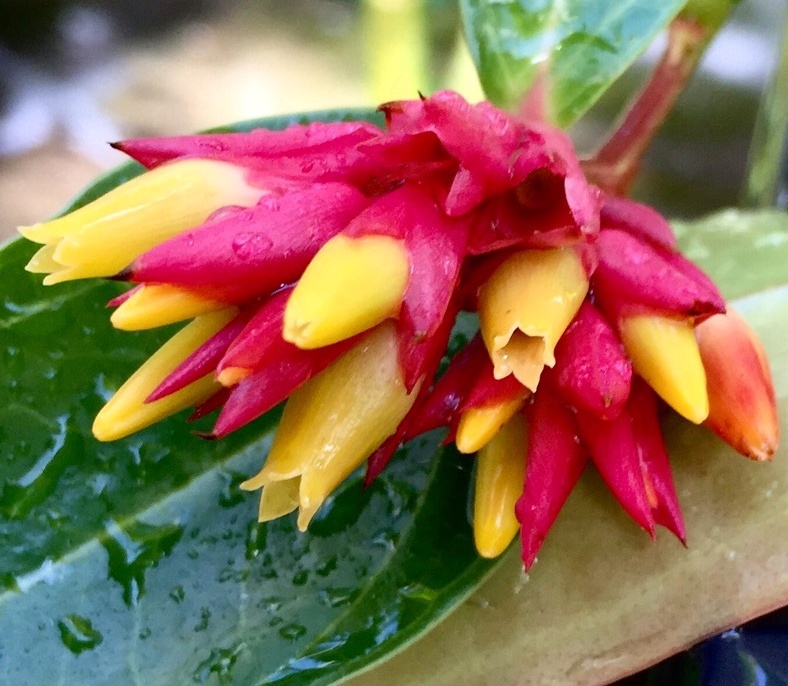 This is a close look at the rare Cavendishia allenii from rain forests of Panama. 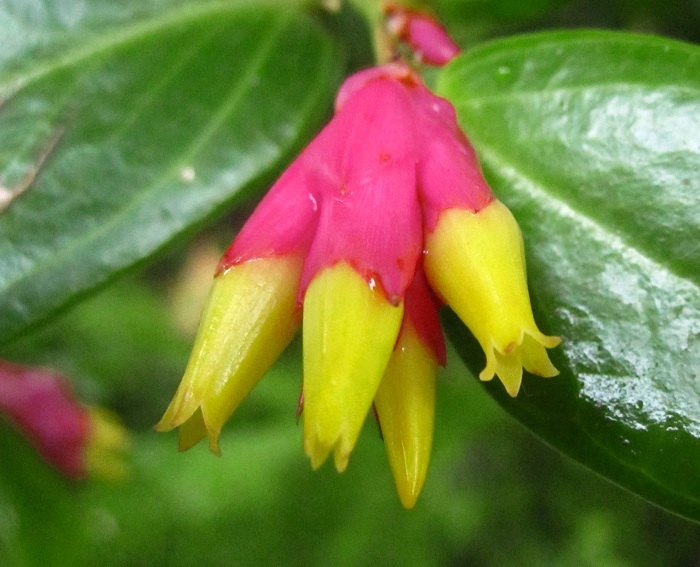 This unusual blueberry relative makes striking clusters of bright yellow flowers that emerge from hot pink bracts. Even without blooms it's a handsome plant, with glossy, thick leaves that are super attractive. 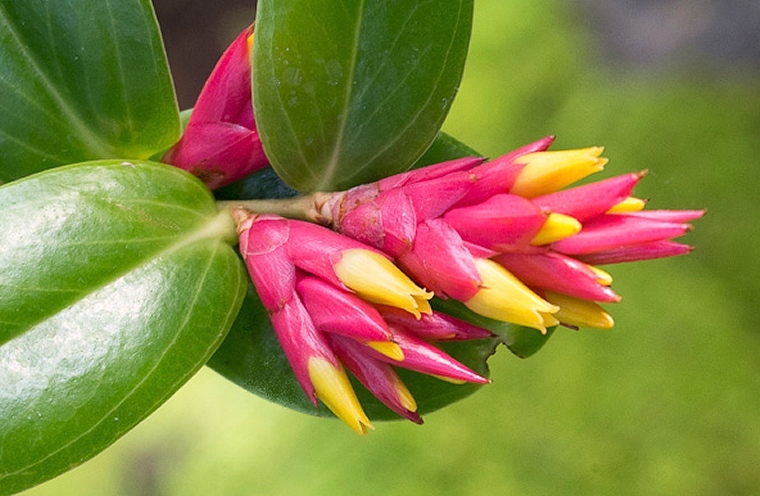 This is a prized collector's plant that's almost never seen outside of a few botanical gardens. I don't know anyone else offering it! It grows as an epiphyte on trees in the wild, making a woody caudex and arching shoots about 3 feet long. Some related species grow rampant over other plants, but this one stays nice & tidy, looking great in a hanging planter or on a shelf. The flowers appear in waves throughout the year. The tight flower clusters emerge from the ends of the shoots and are 2-3 inches long with about 8 to 15 flowers. The tubular blooms are pollinated by hummingbirds in the wild. After pollination it makes berries which are probably edible, but i can't guarantee this. It comes from lowland tropical forests, where temperatures are warm or mild all year. It grows best between about 55 and 85°F (13-29°C). It can probably grow outdoors in Florida and Southern California if protected from frost. It likes very bright, filtered light. Some direct sun is fine if it isn't strong. It prefers a loose, "chunky" soil mix that's slightly acidic. A typical mix is 1 part small-grade orchid bark, 1 part peat moss or coco fiber, and 1 part perlite, coarse sand, or pumice rock. Keep the soil evenly moist. Over about 50% humidity is best. In the right conditions, it's an easy, vigorous plant.